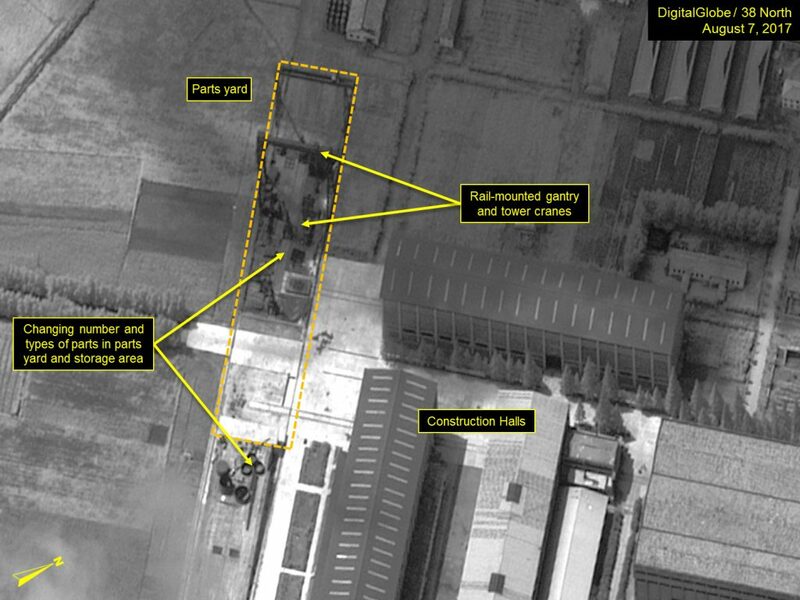 Recent commercial satellite imagery reveals several developments suggesting that North Korea may be accelerating the development of the sea-based leg of its nuclear forces. Of particular interest in the imagery is that netting or tarps have been suspended above both the fore and aft decks of the SINPO-class submarine obscuring any activity taking place beneath them. 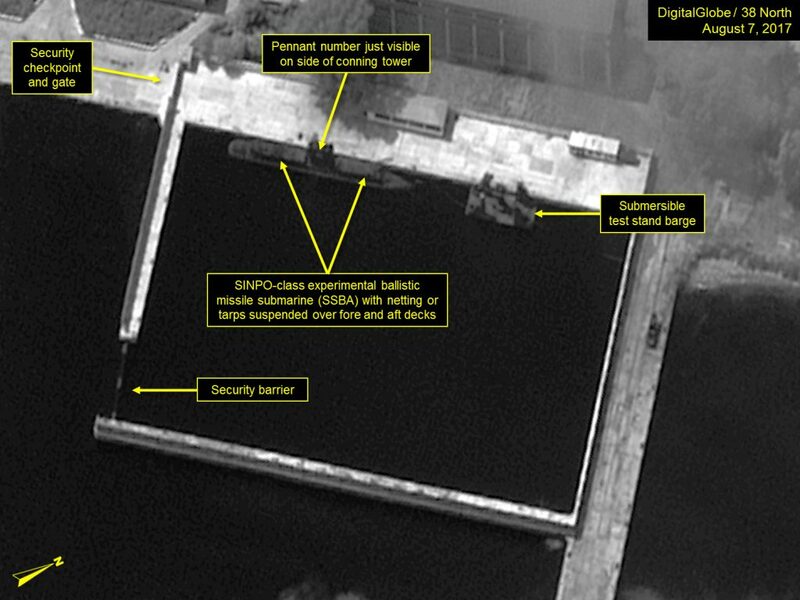 This was last done prior to the July 9, 2016 test of the Pukguksong-1, suggesting that the North may be preparing for a new series of “at sea” test launches, has undertaken modifications or upgrades to the submarine’s launch systems, or is developing a more advanced version of the Pukguksong-1. Recent ejection tests of an SLBM also support the assessment that an at-sea SLBM test may be forthcoming. 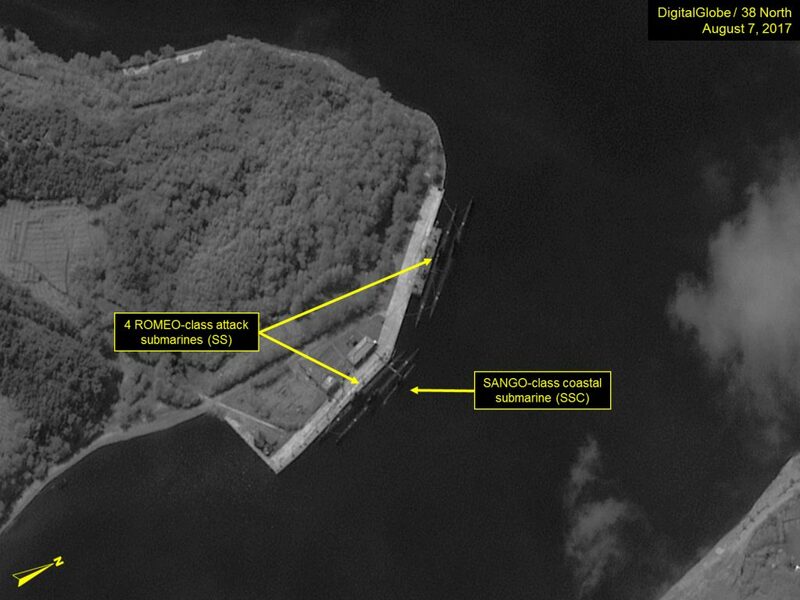 Additionally, imagery of the Mayang-do Navy Shipyard and Submarine Base shows the same number of ROMEO-class submarines that are usually berthed there, indicating that a recent spike in ROMEO activity in the East Sea (Sea of Japan) was a singular rather than force-wide event. 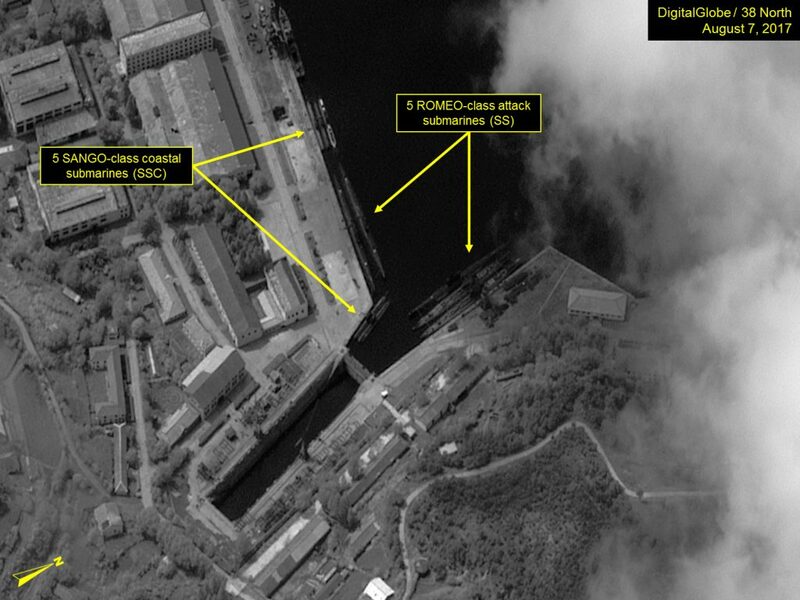 Commercial satellite imagery from August 7, although partially cloud covered, provides a limited look at the status of the SINPO-class experimental ballistic missile submarine (SSBA), the submersible test stand barge and parts of the Mayang-do Navy Shipyard and Submarine Base. As noted in our July report, sometime during the last week in May, the SINPO-class submarine was repositioned forward along its dock and the submersible test stand barge was moved to a position aft of the submarine (both had previously been in their former positions since December 9, 2016). Since the July report, netting or tarps have been suspended above both the fore and aft decks of the submarine obscuring any activity taking place beneath them. The only other time this was seen was during May-July 2016 and prior to the failed July 9, 2016 Pukguksong-1 test. It is unclear if this activity is signaling a forthcoming at sea SLBM test, although the recent ejection tests would support such an assessment. No activity is noted on or near the submersible test stand barge in the latest image. Figure 1. Netting or tarps suspended over SINPO-class SSBA in the secure boat basin. Figure 2. Netting or tarps suspended over SINPO-class SSBA observed in May 2016. 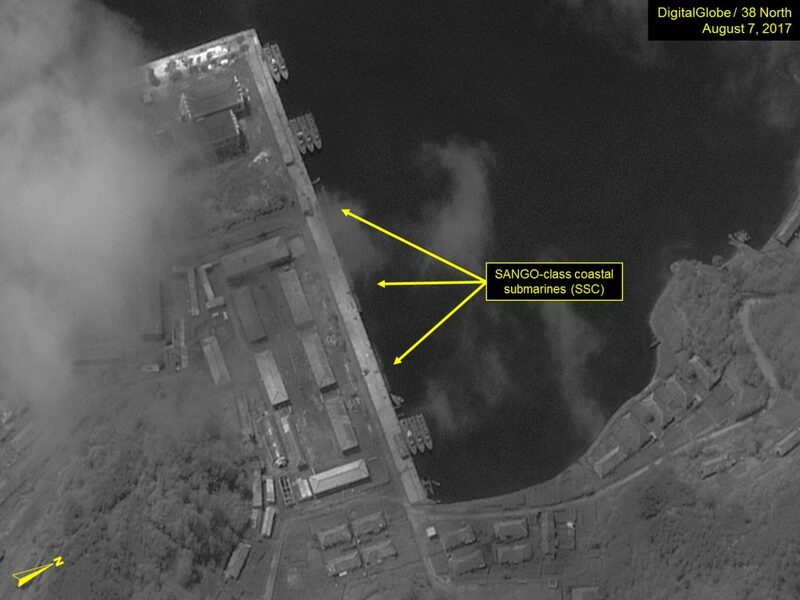 Much of the Sinpo South Shipyard is obscured by clouds, as is the static test stand. In the area of the construction and fabrication halls, the continued movement of large parts in and out of the parts yard and the associated gantry and tower cranes is noted. There is, however, no indication of what is being constructed within the halls. At the southern tip of the Yuktaeso-ri (Sinpo) Peninsula, construction of the new construction hall and its associated L-shaped pier continues at a very slow pace. Figure 3. Movement of parts observed near the construction halls. Figure 4. Construction activity continues at new construction hall. Figure 5. Construction of L-shaped pier continues at a slow pace. 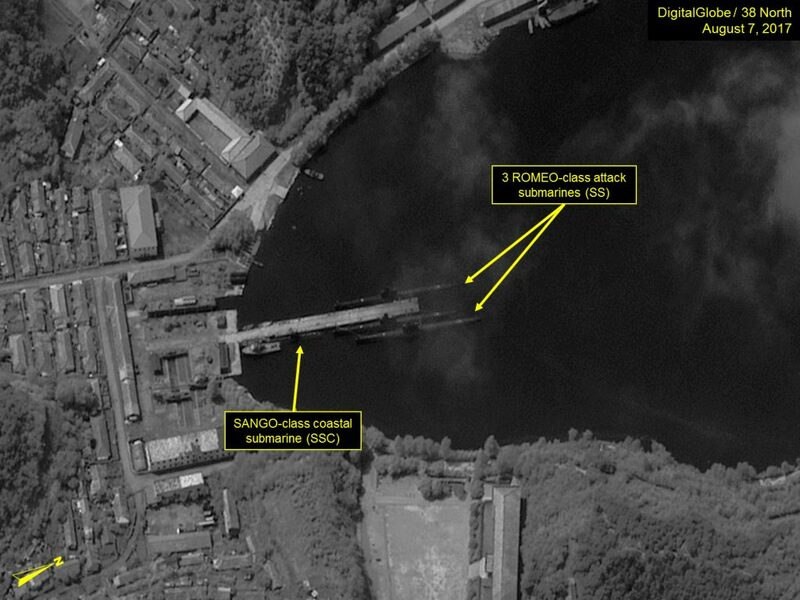 Imagery of the Mayang-do Navy Shipyard and Submarine Base shows the same number of ROMEO-class submarines that are usually berthed there, indicating that a recent spike in ROMEO activity in the East Sea (Sea of Japan) was a singular rather than force-wide event. The week-long patrol by a ROMEO-class attack submarine in the East Sea (Sea of Japan) was “highly unusual and unprecedented,” as Korea People’s Navy submarines have not been known to venture far from their home ports over the past ten years. The few times they have, it has been only to participate in short annual military exercises. 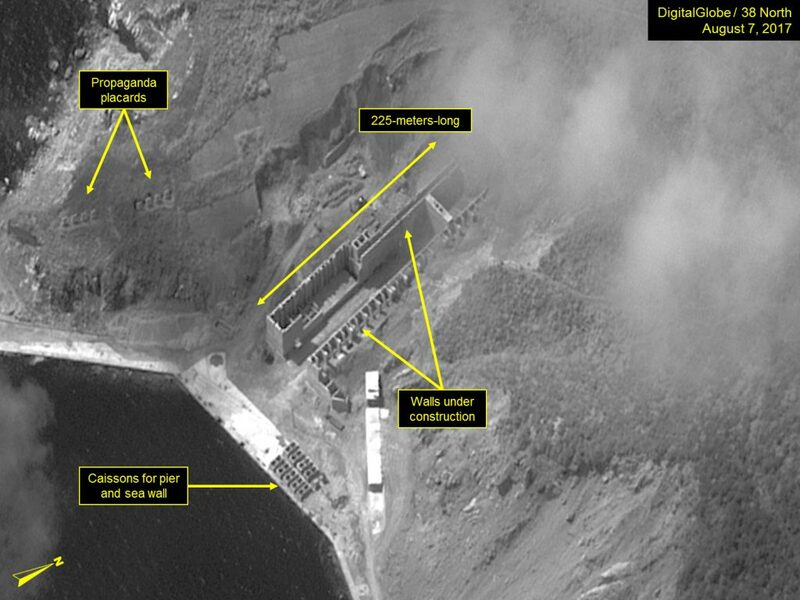 The purpose of this recent activity is unclear, but there are several potential explanations including: Kim Jong Un’s desire to expand his provocative policy of the past two years into the naval arena; a practical exercise demonstrating renewed North Korean offensive naval capabilities (potentially a component of the strategic review of military capabilities ordered by Kim Jong Un when he came to power); a training cruise intended to prepare a submarine and its crew for a longer cruise to monitor future ballistic missile tests or conduct offensive conventional attack missions; validation of upgrades to the ROMEO-class submarine (a number of ROMEO-class submarines have been undergoing extended maintenance and refurbishment during the past five years)—or some combination of the above. The Mayang-do Navy Shipyard and Submarine Base is the largest submarine facility in North Korea and the primary ROMEO-class submarine base on the east coast. 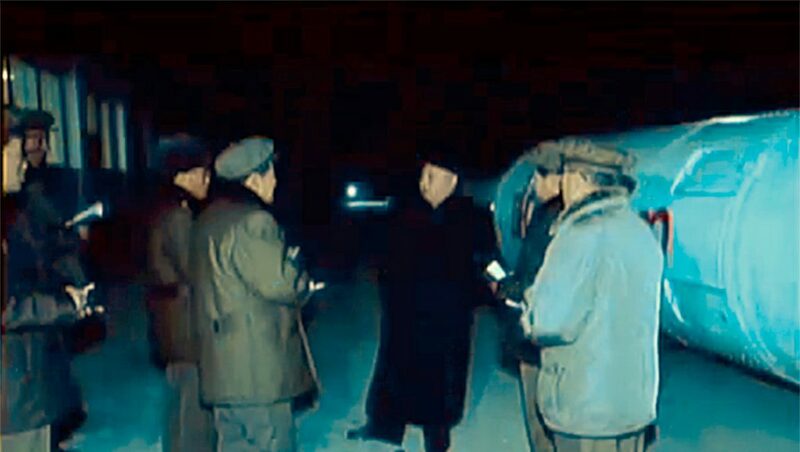 A smaller secondary submarine base is located at Chaho, 45 km northeast of Mayang-do. It is unclear from which base the ROMEO-class submarine involved in the July “unusual activities” was deployed, but it was likely from Mayang-do. A preliminary comparison of the submarine activity at both the Mayang-do Navy Shipyard and Submarine Base during the past twelve months with the August 7 image shows the number of ROMEO-class submarines has remained relatively constant, averaging 12-15; and the number of SANGO-class coastal submarines averaging 11-15. In the August 7 image, 12 ROMEO- and 15 SANGO-class submarines are berthed. This suggests that the July “unusual activities” were a singular event rather than a force-wide event. Regardless, extended North Korean operations in the East Sea should be viewed with concern. Figure 6. Multiple SANGO and ROMEO-class submarines berthed in the Mayang-do Navy Shipyard. Figure 7. One SANGO-class and three ROMEO-class submarines berthed at the south pier of the Mayang-do Submarine Base. Figure 8. One SANGO-class and four ROMEO-class submarines berthed at the east pier of the Mayang-do Submarine Base. Figure 9. 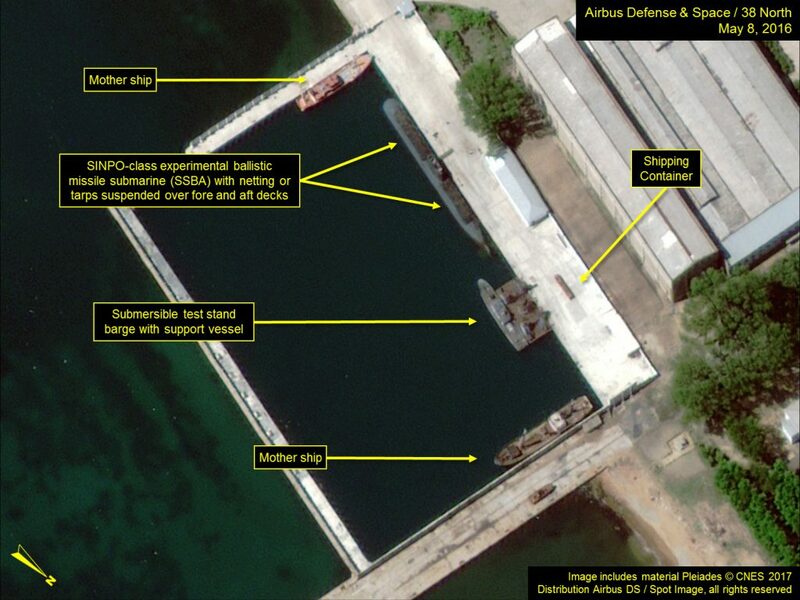 SANGO-class submarines berthed at the northeast pier of the Mayang-do Submarine Base. Known as the GORAE-class by South Korean sources. 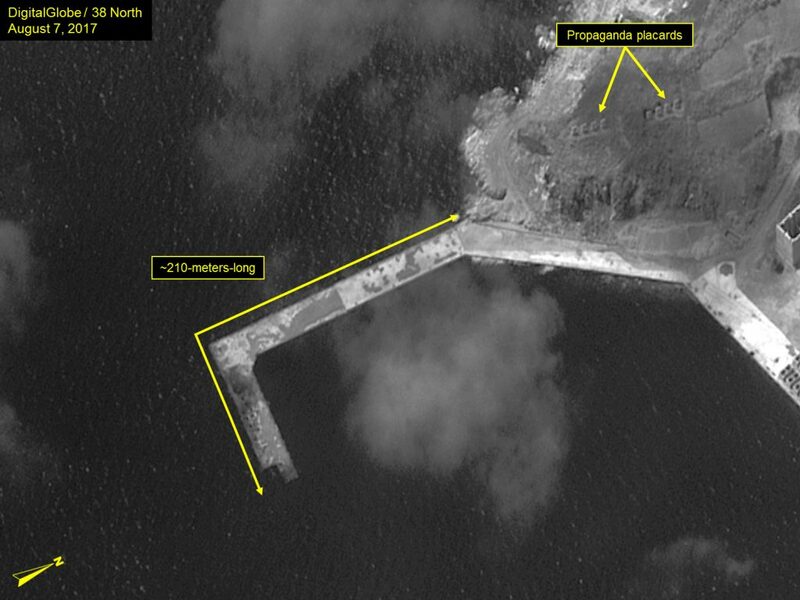 We were unable to conduct a similar comparison of the Chaho Submarine Base as there was no recent high-resolution (50 cm resolution or better) of this facility available. Additionally, the Chaho base presents a challenge in assessing submarine strength based there as it has an underground berthing facility in which the Korean People’s Navy can house a number of ROMEO and SANGO submarines. The total number of ROMEO submarines in the August 7, 2017 may actually be 15, as a dock along which two of these submarines are normally located was obscured by clouds in the image.